Similar to the FeedbackBubble effect, but the current frame is composited over the previous frames using a Matte input. For each new frame, the previous frames are transformed before the current frame is composited over them. The feedback is reinitialized whenever any non-consecutive frame is processed, either the first frame, reprocessing a given frame, or jumping to another frame. You must process multiple frames of a clip in a row to observe the effect. Z Dist: Default: 0.95, Range: 0.001 or greater. Bubble Amount: Default: 0.05, Range: any. The amplitude of the noise pattern used to create the distortion. 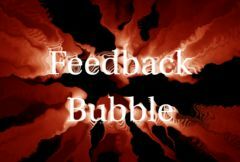 Bubble Freq: Default: 16, Range: 0.01 or greater. The spatial frequency of the initial noise pattern. Increase to zoom out, decrease to zoom in. The relative horizontal frequency of the noise pattern. Increase to stretch it vertically or decrease to stretch it horizontally. Bubble Shift: X & Y, Default: [0 0], Range: 0 or greater. The horizontal and vertical translation of the noise pattern. Shift Speed: X & Y, Default: [0 25], Range: 0 or greater. Bubble Octaves: Integer, Default: 1, Range: 1 or greater. Bubble Seed: Default: 0.123, Range: 0 or greater. Used to initialize the random number generator for the noise pattern. The actual seed value is not significant, but different seeds give different results and the same value should give a repeatable result.